This entry was posted on Friday, October 14th, 2011 at 06:40 and is filed under Occupy Wall Street, Politics. I’m struggling to maintain my composure at this point, as I consider this gaggle of long-term free-loaders being chased off in search of showers and real toilets. I wonder if Soros will also hire actors to play the part of sanitation workers. Is it possible that the occupation is losing steam? It’s certainly not getting the support in polls it once did, but that was to be expected as these useful idiots went from novelty to nuisance. You can count on them coming back in time for next year’s election, at the latest, but for now, they’re making plans to move their encampment. “They would be breaching the law. They would be violating those folks who they would seek to remove and possibly arrest, their fundamental rights to utilize the park and to express their opinions and exercise their First Amendment rights,” Yetta Kurland, with the National Lawyers Guild, told CBS 2′s Hazel Sanchez. What? Of course, it doesn’t really say she’s a lawyer. Yetta Kurland might be a janitor, for all we know. 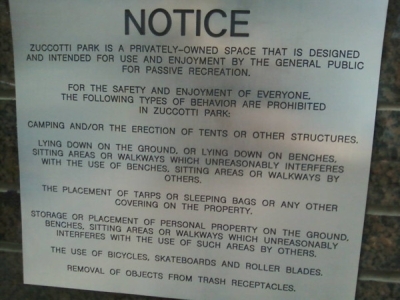 The park in question is private property. This is no different than if a person were to tell some assembly of people to get off his lawn. Essentially, this is an extension of property rights, and the question of what constitutes trespassing. Now I realize the law in New York State are somewhat different from the laws in Texas, but honestly, when delivered the instruction by the owners to leave, whether to clean it, or if for no other reason than the owners just want them gone, the police must act to enforce the property rights of the owners, right? There is no first amendment right to assemble on my lawn. Here in Texas, if I say “Get off my lawn,” you are right to imagine Clint Eastwood in Gran Torino. The first amendment provides protections of the natural right to peaceably assemble. It doesn’t give a mob the right to gather on private property, and deprive the owners of the property the ability to use it as they see fit. I think it’s time these pests got a little dose of reality. I certainly hope Bloomberg finds the guts to deliver it, but I don’t have a good deal of confidence in him. The problem is that these free-loaders don’t care about property rights, and in fact, oppose the concept. They’re protesting capitalism, among other things, and for once, it’s time for capitalism to answer. UPDATE: As I feared, Mayor Bloomberg has caved. Sad to say the park owners changed their minds and are letting them stay for the time being and no one knows why they changed their mind. It's called "cowardice." The mayor is a moral coward. Yeah, I just heard that this morning on the News. Bill Orielly was being interviewed about the OWS protesters. He has a really good take on it, and his comparison to Tea Party protesters and OWS protesters was dead on. Tea Partiers had specific reasons for their protests, and the OWS don't. They still don't. just in case you have not seen this. I'm sure some of those 'kids' had no idea. I think the mayor should be fired for allowing this to get going as much as it has. He has a responsibility to all of the businesses and residents in that area. His job is not to facilitate open-ended protests that hurt those same businesses and residents. Regardless of what you think of the protests, open-ended is not acceptable! !